I'm by no means experienced with bloat in dogs, but I am well-prepared. I have asked many vets and dog owners who have experienced bloat about bloat kits, and their unanimous answer is "Don't use it. Get to the vet ASAP!" I can't provide any insights on the experience of using one, but I can tell you how to make one. I keep a bloat kit at home and in each vehicle. 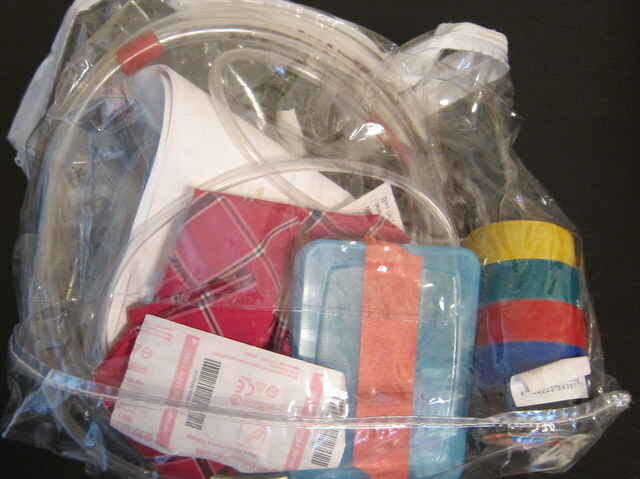 My bloat kit stored in a large plastic bag. Before we proceed forward, read up on bloat and how to use a kit. Read up on how to recognize the signs. It can happen to any dog. Here's some articles to read. 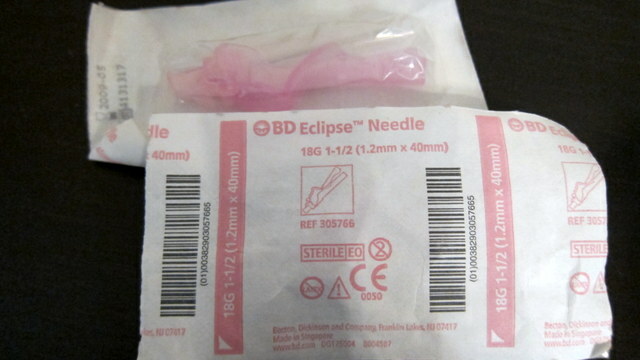 large gauge needles. A small sharp knife would work just as well. 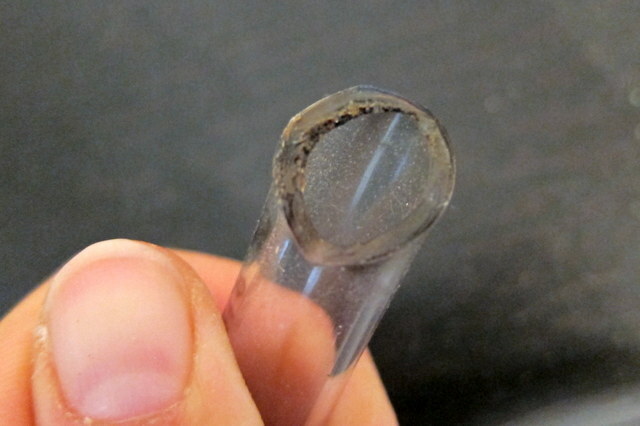 a plastic syringe without the needle for liquid medications. I typically give liquid medication when I'm at home. Most of these items are pretty straightforward, but I'll go into details on ones that could have some variation. 1. Something to keep the dog's mouth open - many of the purchased kits have special items, but it can be as simple as a hard tube. In the ones I keep in the house, I have a roll of electrical tape. 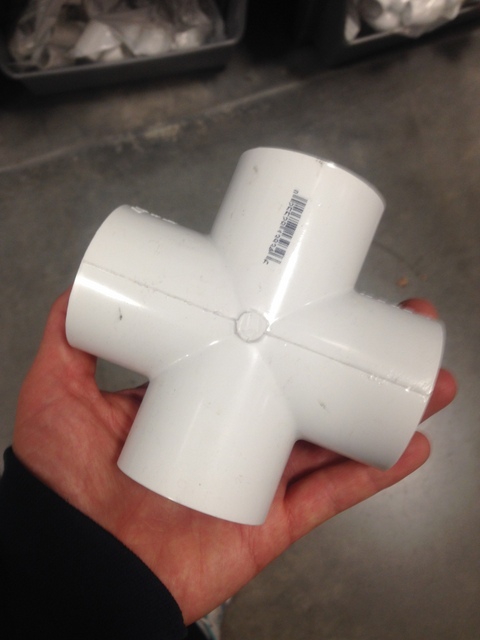 You could also you a PVC T connector. Or you could drill a whole through a block of wood. It really doesn't matter what you use. The objective is to keep the dog's mouth open so you can insert the tube. 2. Something to attach the something in the dog's mouth - I use a strip of cloth, but you could very well use a roll of vet wrap, which would probably work better. However, heat and time will deteriorate the vet wrap making it hard to unravel and not sticky anymore. You'll have to remember to replace vet wrap from time to time. 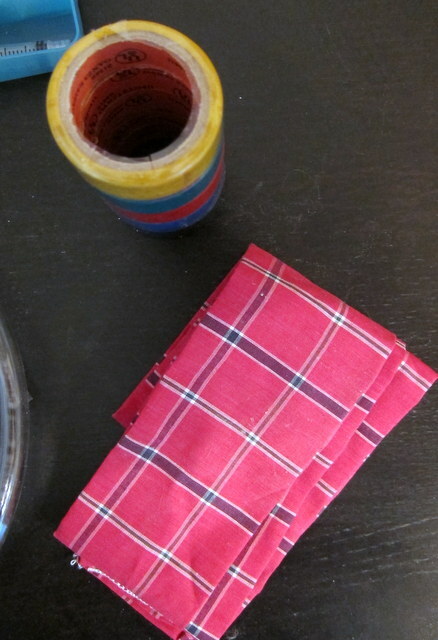 You could also use a handkerchief or even duct tape. 3. Lubricant - I purchased generic personal lubricant and filled three vials with it. You could just put the entire time in the bloat kit, if you like. I just happened to have vials and needed to split the lubricant into several bloat kits. 4. Plastic tubing - You can purchase this at any pet store by the foot. For my giant dogs (90-130 lbs), I would get about four to 4.5 feet of plastic tubing. You might need more or less depending on the size of your dog. Use the instructions here to figure out where you need to mark the tubing. Read under 5. First Aid at this site to figure out how to measure your dog. Once you have it marked, carefully melt the ends of the tube over an open flame to soften the edges. It just takes a few seconds to do. 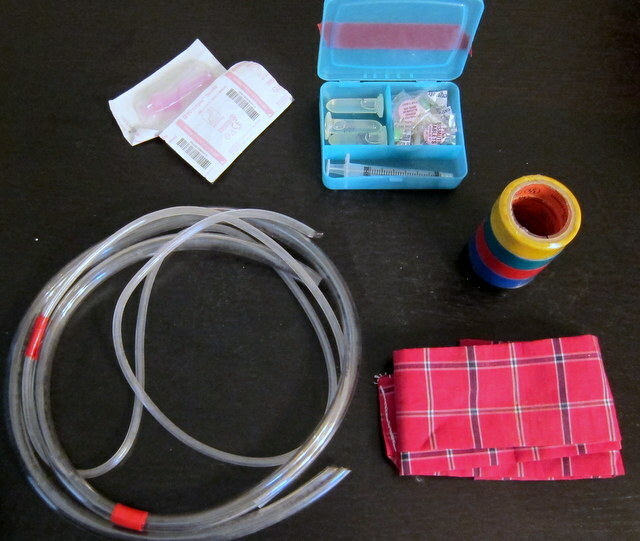 Now you are armed with information on how to make your own bloat kit. Be prepared, but do go to the vet first. Your dog's life depends on it. My bloat kit all laid out. 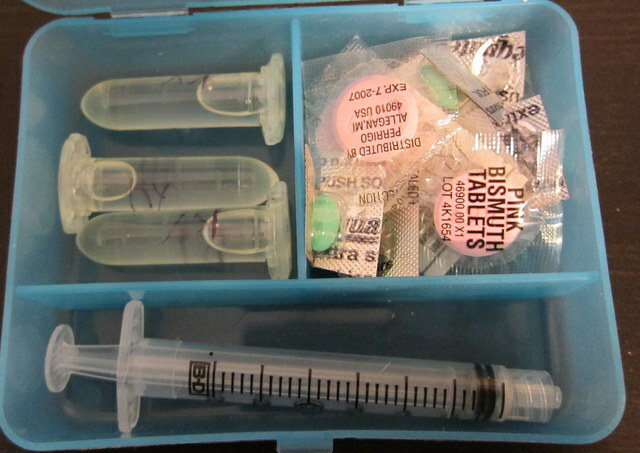 Lubricant, pepto, gas medication, and a needleless syringe. Something to keep my dog's mouth open, and something to tie it to my dog's head. It is just a scrap of cloth. You could use a handkerchief or even duct tape. PVC T connector that can be used to keep your dog's mouth open. Large gauge needles. Also, smaller the number, the bigger the needle. You could use a small knife too. Melted end of the plastic tubing.